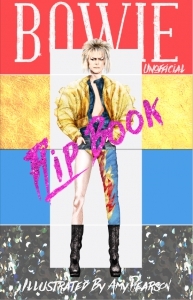 Illustrated by Amy Pearson, this books breaks down Bowie's looks into 4 sections and lets you reconfigure, change and flip around. You can mix and match the outfit creating something fresh, fancy and absolutely new. Take on the spirit of the legend and create your own brand new styles. The man responsible for looks that defined the 20th Century. David Bowie's characters widened the mind of society, let us glimpse at new untold realities and set trends the world around. What's your favourite? Aladdin Sane, Ziggy Stardust, The Thin white Duke or good old David Jones?